Tasteful Selections™ sponsored today’s post and I’ve created a delicious recipe with their cute little potatoes, which you’ll definitely have to make for the holidays! Thanksgiving is coming up fast. In Durham we have a Triangle Vegetarian Society event that’s the largest vegan Thanksgiving feast in the country! My friend Linda Watson, from Cook for Good, already scored us all tickets and I can’t wait to go. It has multiple seatings and still sells out the day registration begins. The buffet line is something out of a 4 star brunch – only everything is vegan! They even have gluten-free, soy-free and sugar-free options. Please come up and say hi to us if you’re there. If you’re cooking at home you get more Thanksgiving side dishes on this post. 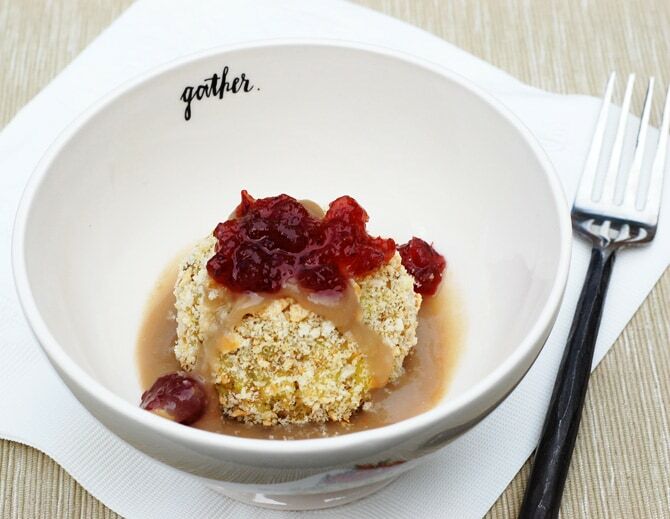 Scoring my reservation got me to thinking about stuffing, mashed potatoes and cranberry sauce. They are a few of my favorite things – and probably on your list as well. 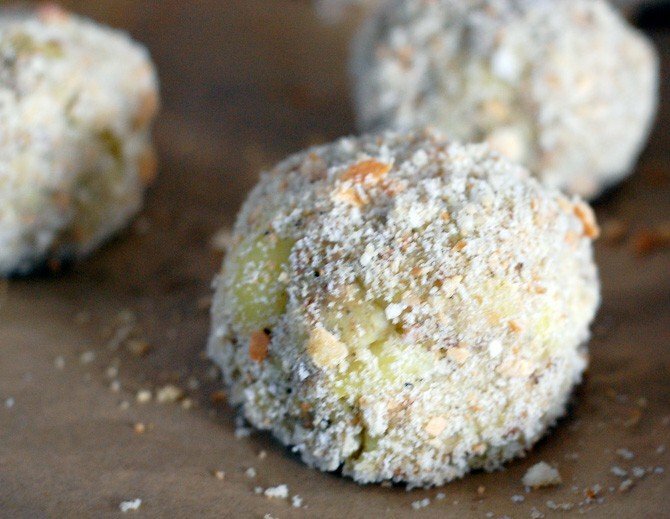 I put on my mad scientist thinking cap and came up with a ball made of mashed potatoes and stuffing – mixed together, rolled in breadcrumbs and baked until golden brown. There’s even a surprise of some cranberry sauce buried in the middle. I topped mine with vegan gravy and a little extra cranberry sauce to make them just right. This post was sponsored by Tasteful Selections™ to promote their partnership with Katie‘s Krops. That means I get paid for recipe development and posting the recipe on my blog. With that said, we have been eating bag after bag of Ruby Sensation and Honey Gold small potatoes and I truly think they are delicious. This recipe uses a pre-made stuffing mix. 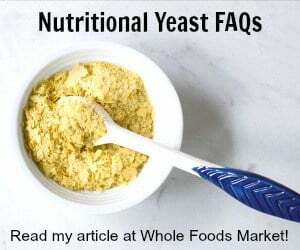 I got mine at Whole Foods but it’s very important that you make sure it’s labeled vegan or carefully read the ingredients. Many stuffings have animal fat or other animal products in them. You can make your own by using stale bread. Don’t have any stale bread? Leave a loaf of french bread out overnight and it will dry enough to use. You don’t want to use fresh bread because you’ll have more of a bread mush after you add liquid – ick! Also add in some sage and rosemary to give it that signature stuffing flavor. These do take some extra prep time, as most single serving portions do. Take advantage of the extra people in your house for making these and kids will love making them too. It’s a good excuse to get their hands dirty and they get to eat what they worked on! These are great in a large size as a main course or a side. Make them small and you have a very interesting appetizer! Either way serve with some vegan gravy. First put the potatoes in a soup pot and cover with water. Bring to a boil, then lower heat to medium and cook for 12 to 15 minutes, until they are easily pierced with a fork. Drain and set aside to cool. Follow the directions on your stuffing by boiling the amount of water or vegetable broth called for, then remove from heat, stir in the dry stuffing, and let sit covered for about 10 minutes or until it's absorbed all the liquid. In a large mixing bowl mash the small potatoes as is, with the peels on. Mash with a potato masher leaving only small pieces of potato. Note: you can add up to ¼ cup olive oil if you want. I decided the fat in the gravy was enough to carry the dish. Stir in the milk, salt, sage, celery seeds, rosemary and pepper. Then stir the dressing into the potato mixture. Preheat oven to 350 degrees and cover 2 large baking sheets with parchment paper. Now we need to get some cranberry sauce inside the mixture piece by piece. 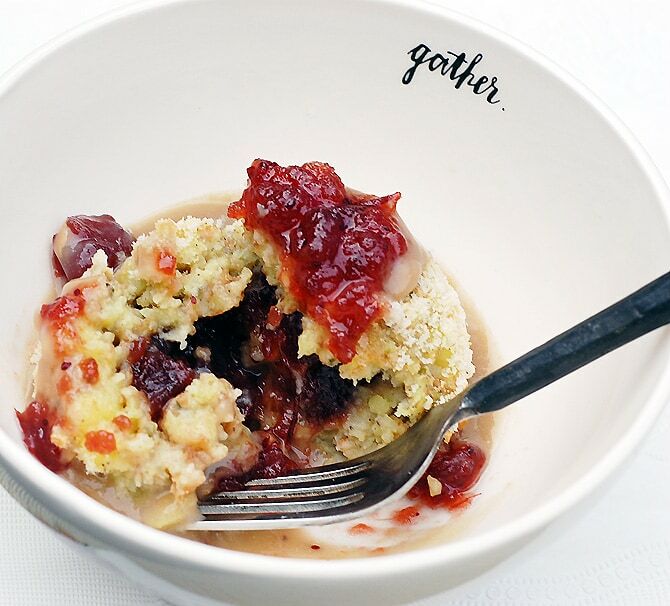 For the large ones I used ½ cup potato stuffing mixture and 2 teaspoons cranberry sauce. 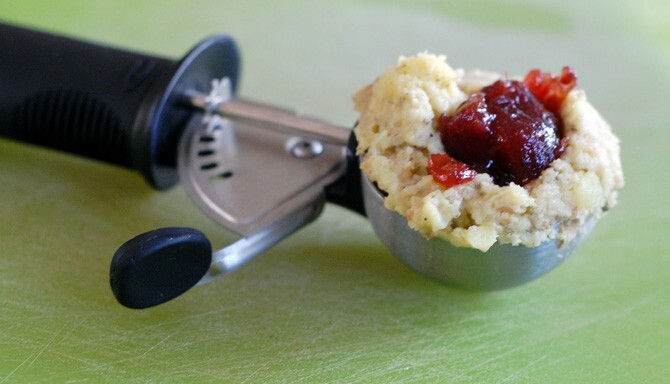 For the small ones I used 1 tablespoon potato stuffing mixture and ¼ teaspoon cranberry sauce. First I recommend that you use a scoop to get each one about the same size. Scoop all the dressing mixture piece by piece and sit them on parchment paper. Next flatten out one of the portions of stuffing you scooped out, make an indention with your thumb, then fill the indention with cranberry sauce and roll into a ball then roll in bread crumbs and set on the baking sheet. Repeat until both sheets are full of ready to bake balls. Bake large ones for about 20 minutes or until hot in the center, small ones for about 12 minutes. Serve large ones as a main over a bed of gravy with extra drizzled on top. Serve small ones as an appetizer with a bowl gravy to dip in or on appetizer spoons in a pool of gravy. 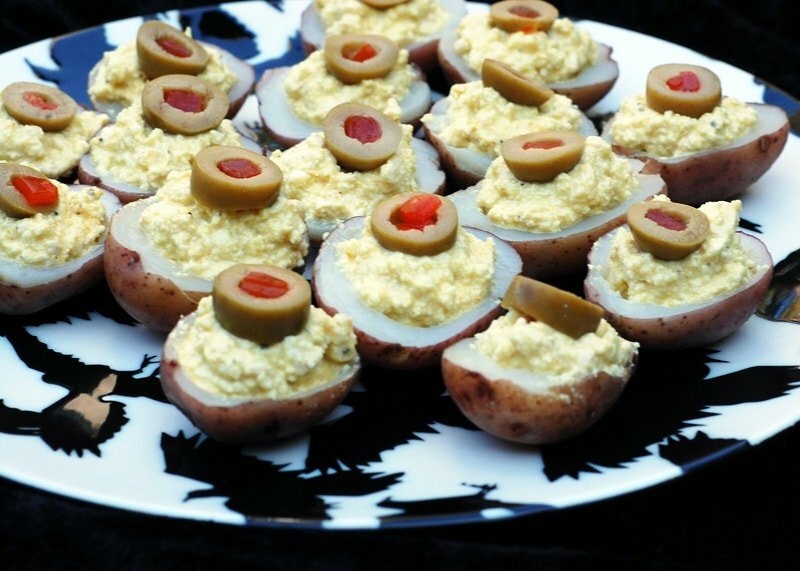 Don’t forget about my vegan deviled potatoes recipe for a super easy holiday appetizer. Kathy, I love this idea! I’m wondering if this would be a great dish to freeze? Would then have a very tasty side for numerous meals. I think so – I have some in the freezer now so I’ll report. Potatoes can be a little weird in the freezer, so the texture might change slightly. I’m hoping since it’s mixed with the dressing they will be fine. Great, I’m going to hold off making these until next week. Thank you for this recipe. It combines so many of the best Thanksgiving foods! But I make sure to always have mashed potatoes on the table. You can also make these with your leftovers after Thanksgiving. Wow, these are inspired! Some one, please pass me some potatoes! I can’t wait till Christmas! Classic mashed potatoes with gravy, all vegan of course, is a standard on our table! Mashed potatoes. But this recipe gives me some inspiration to broaden my horizons. My favorite Thanksgiving dish is cranberry relish with walnuts and pineapple. Yum! I think these balls will be served this year 😉 Yum!!!!! I must have sweet potato casserole at my Thanksgiving table. Raw cranberry relish; but I love all things cranberry. I want to make your recipe for Christmas. 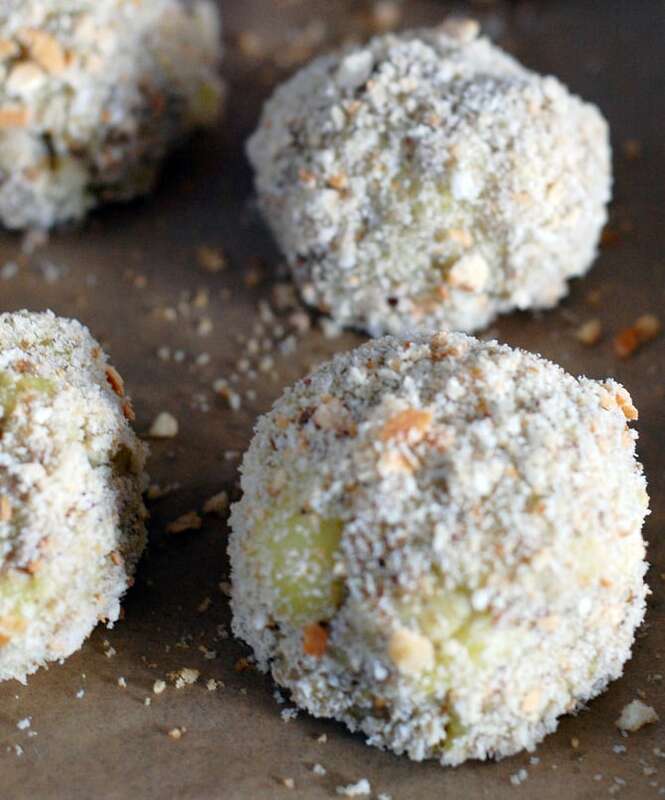 I bet these balls would work great in the air fryer! Are you supposed to add the carrots and celery to the stuffing mix that it calls for on the package? You can, but if you do make sure to mince them. Thank you for your quick response! I made these tonight and put them in the fridge on their pans so that I can take them out and bake them tomorrow to take to my husband’s family thanksgiving! Can’t wait to taste them!